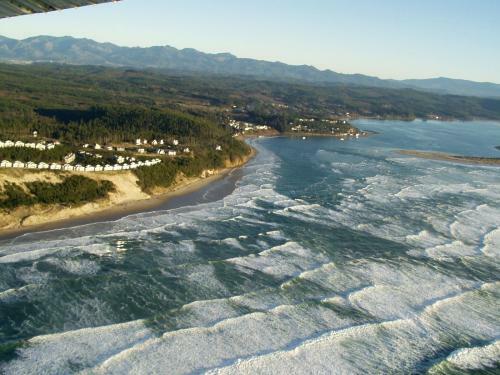 "Just possibly, the best spot on the Oregon Coast!" The Oregonian goes on to say that Happy Camp Hideaway is "so close to the wild Pacific Ocean that you can reach out the window and grab a fistful of sea gull feathers"
Quiet, unspoiled and very, very scenic. Happy Camp Hideaway Resort was originally built in 1902 as a beachfront inn. For over one hundred years it has provided guests one of the most unique experiences on the Oregon Coast. We can accomodate large groups including weddings, family reunions, company gatherings. If your group exceeds the maximum occupancy of your rental unit at any time during your stay, preapproval from us is necessary. Additional agreements, insurance and fees may be required. Please see Occupancy Limit tab on the left for more information. We have maintained the beauty of this historic resort while providing guests with all the modern facilities. There are eight rentals available in the beach front resort ranging from our five bedroom Homestead House (the oldest structure in Netarts), to our lovely one and two bedroom cabins with names that inspire beach side whimsy (The Nautical Star, Anchors Away, don't you just love it!). Just outside of the resort walls, you will find the rest of our vacation homes that are well appointed with luxury amenities. With twenty-eight different rentals to choose from, we can accommodate groups of all sizes! Netarts Bay provides some of the best crabbing and clamming on the Oregon coast. For hiking enthusiasts we are located near many scenic trails in addition to miles of majestic coastline right at your door step. Enjoy a candle light meal in the comfort of your vacation rental or take advantage of the many fine restaurants in the area. The possibilities are endless! With fifteen pet friendly vacation rentals, Happy Camp Hideaway provides a great time for the entire family. (Please read our Pet Policy.) Happy Camp Hideaway Resort and the Netarts Bay Beach, right at your door step in most cases, is off-leash! So don't hesitate to bring your well behaved pooch and give them a vacation as well. 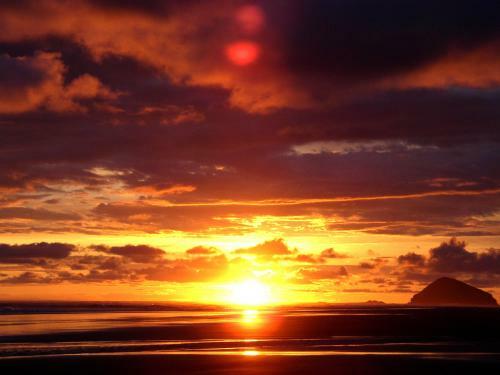 We’re located only 90 minutes from Portland, Oregon, just outside of Tillamook, on the beach between Netarts and Oceanside. A brand new Executive Home. Check out King's Hideaway now. Come visit us today for an unforgettable experience! We now offer kayaks, stand-up paddleboards, and beach bikes for our guests to use at no charge!